UGH! Sorry-this was suppose to post on Sunday! I didn’t even realize it never did! I’m back again for another post! Can you believe it?! LOL! I’ve been posting a few times a week since we began the new My Time Made Easy ™ LLC Blog! I have to say I’m so enjoying all this extra inspiration to share and post. I missed it. Granted, I’m running like CRAZY, but it feels good to share more often. OK here is the next challenge. 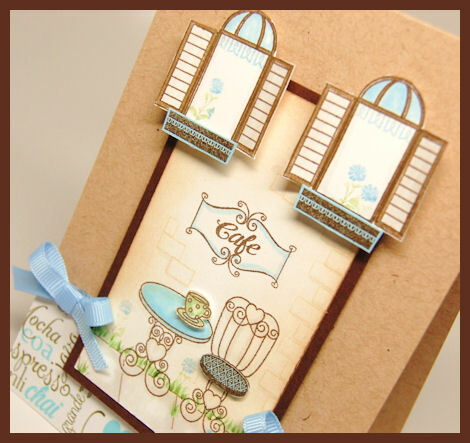 CLICK HERE for details and to enter your own creation! I really loved the colors on this, so I decided to dust off an “old” set and make it fresh and new! 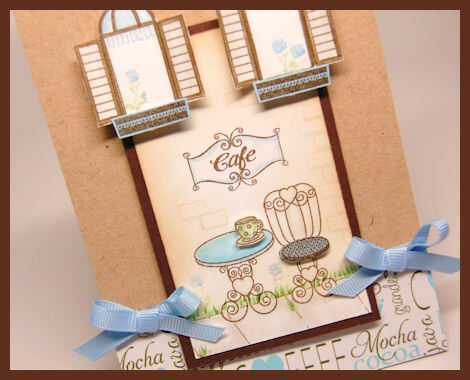 I used the A Lil’ Cafe © 30 Images set to make this card., which was designed to look like the outside of a Cafe (obviously! LOL!). The brick pattern is stamped in a pale tea dye ink along the edges. 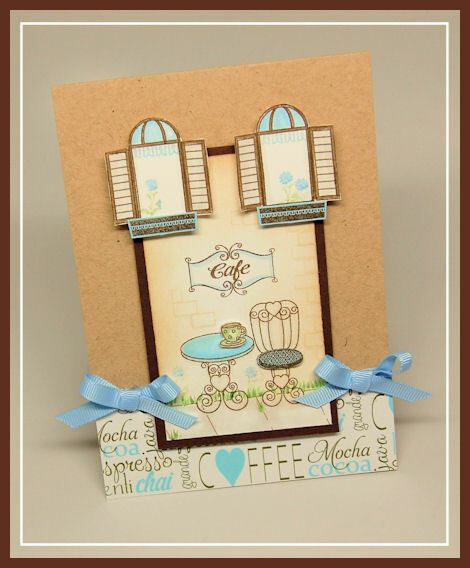 I sponged on some tea ink to make it look like the outside of an aging painted brick cafe. There is a lot of dimension on this one, as you can see. My coffee cup, and chair seat are stamped, colored and cut, then raised with dimensionals. I love the windows! They are so pretty!! 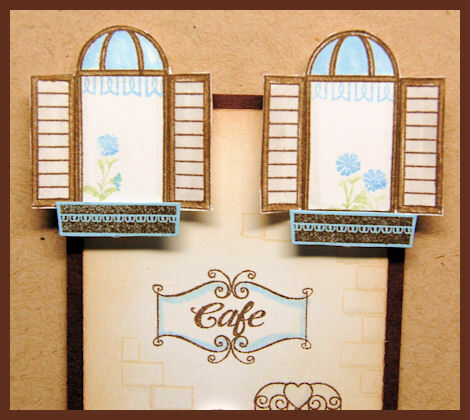 I stamped the windows, adding the shutters, and the “curtain” trim, colored and cut them out. 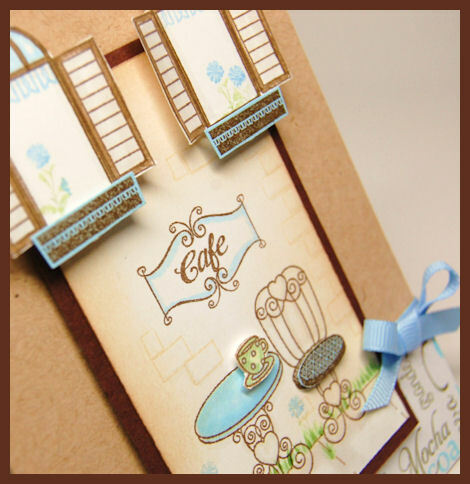 I also added the flowers (they are in the set) so they appear like they are growing out of the window boxes, which were stamped on blue cardstock, in a brown ink. They were added using dimensionals. 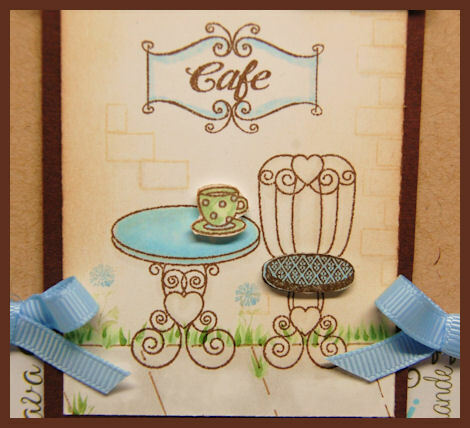 I stamped on the sign images, and added the Cafe sentiment to the center. After everything was stamped I used my ruler, and black drawing pen to create my own sidewalk, adding grass with my marker. I also added some flowers to the sidewalk too. I took the All Steamed Up © digital paper, and changed the pink, to blue, to match my creation. I love that! It was the perfect additon to this! Thank you to Lisa for choosing such a fun Pretty Palette! I hope you all can give it a try too! 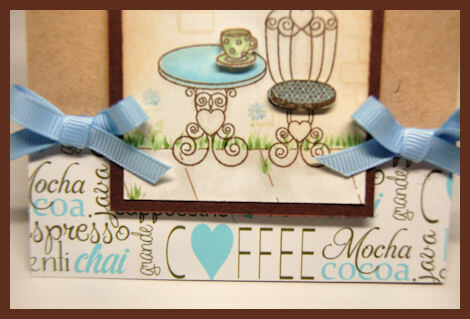 I’ll be back on Thursday, as it the first day of peeks for the April 1st Release, and the next Pretty Pattern Challenge! 11 Responses for "Pretty Palette 02"
[url=http://www.shoesaleon.com]Nike Air Max Shoes[/url] with molded design helps to reduce skidding shoes I make wearing more comfortable. [url=http://www.shoesaleon.com/nike-air-max-2011-c-10.html]Nike Air Max Sale[/url] 60% discount and free shipping now. Hi there! Awesome topic, however internet site is unable to display screen around FF4 try out. Really does the web server neighborhood this Ip? Thank you. “Unintentional swordsman!””Bite ~! Congratulations on the success of christian louboutin ukyour name, your face shape can be adjusted!””No adjustment!””Whether to adjust the face?””No adjustment!”Kidding, I want to burst into the game the first time, see if I can become the top few people into the game, what reward might even get hold of it! How could such a thing to waste time!”Please select the job!”The following appeared in a row option, Xiangyebuxiang, is the point directly Swordsman!”Congratulations, your account has been established, and now into the game?”I’ll point to enter the picture of a switch, I have appeared in a run-down village.System immediately came the prompt:”Bite ~! Welcome you into the game, your location in the first 10 086 No. Xinshoucun, because you are the first 8888 tochristian louboutin sale enter the game, awards 200 experience points!”By this figure is too TMD Geely, the decisive shot pictures!Only covered a warm feeling, a flash of gold, 200 experience points directly to a level I rise!But still a little disappointed, so supposedly unlucky number should be given an artifact, or directly to a super-hidden career, only to 200 experience points, which pullthe silver on the group too!Check the package, only a rough wooden sticks, as well as a some tattered clothes and see me some silent! [Poor] stick (novice equipment)Attack 0-1Requires Level: 0 Poor commoner (Novice equipment)Defense: +1Requires Level: 0……Fork of two very cattle equipment, cattle fork to find a worse than he, well, first put on repeat! And then looked under their own property!Players: mood swordsmanRating: 1Occupation: noviceBlood: 11Magic: 5Attack 1-2Speed:Physical Defense: 2Magic defense: 1Reputation: 0Lucky: 0……Ah, this property is relatively invincible, equipped with only 1-2 attacks, this property was moving monster cut it? It is really nice and short guide. Thanks for sharing.